"The last full measure of devotion"
On Memorial Day, it is a TommyWonk tradition to ponder the words of the Gettysburg Address. Here is the infamous Powerpoint version, a lesson in how to take a powerful message and reduce it to mush. Fourscore and seven years ago our fathers brought forth on this continent a new nation, conceived in liberty and dedicated to the proposition that all men are created equal. Now we are engaged in a great civil war, testing whether that nation or any nation so conceived and so dedicated can long endure. We are met on a great battlefield of that war. We have come to dedicate a portion of that field as a final resting-place for those who here gave their lives that that nation might live. It is altogether fitting and proper that we should do this. But, in a larger sense, we cannot dedicate, we cannot consecrate, we cannot hallow this ground. The brave men, living and dead who struggled here have consecrated it far above our poor power to add or detract. It is for us the living rather to be dedicated here to the unfinished work which they who fought here have thus far so nobly advanced. It is rather for us to be here dedicated to the great task remaining before us -- that from these honored dead we take increased devotion to that cause for which they gave the last full measure of devotion -- that we here highly resolve that these dead shall not have died in vain, that this nation under God shall have a new birth of freedom, and that government of the people, by the people, for the people shall not perish from the earth. The Lincoln Memorial is being rededicated today, in this the bicentennial of his birth, and four score and seven years since it was first dedicated on May 30, 1922. Wilmington’s Memorial Day parade, which is always held on May 30, begins at six o’clock this evening, starting near Rockford Park and marching down Delaware Avenue to the Soldiers & Sailors Monument at Broom Street. Mike Matthews at Down With Absolutes was quick to take note of a small innovation in state government: Matt Denn has started the state's first official blog. But, as the saying goes, no good deed goes unpunished. The comments thread at DWA devolved into a long argument on whether Denn should allow comments, which promptly settled the issue for me. The ever cheerful Dave Burris sniffed that, without comments, Denn was being held to "a lower standard," and so "on with the propaganda." Then email him. Call his office. Walk to the office and set up an appointment. The man isn’t Howard Hughes, it’s not like he’s unavailable. Matt Denn has an engaging, informal way with words that works well in a blog. I'm glad we will be able to read what he has to say--without the boorish comments proliferating like fungi throughout the blogosphere these days. Were Chrysler Dealerships Closed Based on Politics? Doug Ross points out that there is a heavy correlation between big Republican donors and which Chrysler dealers got their licenses yanked. Very interesting. Doug Ross blows the doors off of any doubt that the Chrysler shutterings were politically-motivated. Welcome to DealerGate. Ross reviews the relative merits of closing several dealers, and concludes that the odds against closing just five particular dealers is "one ten-millionth of one percent." Now I defy any serious student of statistical analysis to find a text that shows how a sample of five cases can yield such a high level of confidence. Also left out of these calculations is any reference to a control group. How many car dealers overall donate to Republicans, and how many to Democrats? Without that number, the "heavy correlation" is meaningless. Overall, 88 percent of the contributions from car dealers went to Republican candidates and just 12 percent to Democratic candidates. By comparison, the list of dealers on Doug Ross's list (which I haven't vetted, but I assume is fine) gave 92 percent of their money to Republicans -- not really a significant difference. There's no conspiracy here, folks -- just some bad math. So an alarming inference vanishes in the face of a straightforward statistical comparison. Come on guys, do your homework. Does Green Energy Cost Jobs? Spain’s touted program cost 9 jobs for every 4 it created. I will await Tommy’s response to the study. When we spend money to build a fast food restaurant instead of solar panels, the cost of this course of action is all of the panels that were never built and all of the jobs in that industry that were never created. Similarly, if the government decides to spend taxpayer money on windmills or solar panels, their unseen cost would be all the hamburgers not cooked or any other productive activity that would no longer take place as a result of the state directing resources to windmills or solar panels. I heard the same argument during Delaware's wind power debate. Opponents called it the green premium, which came with some often wildly exaggerated numbers. The crux of Professor Alvarez's argument is that wind power in Spain costs 59 percent more than the overall market price. Based on that figure, Alvarez comes up with a suitably scary number of $10 billion of wasted investment. I could not find the source data behind the 59 percent premium, though I learned in the wind power debate that such calculations depend on the assumptions and data used. I was able to do some homework on Spain's electricity market, which I found is much different than ours. It turns out that Spain's electric grid is almost entirely isolated from the rest of Europe; the interconnection with France can carry no more than 3.5 percent of Spain's peak demand. Inside this isolated market, two companies, Endesa and Iberdrola, control about 45 percent of the generating capacity and 75 percent of sales. Prices have in fact fallen by 2% in nominal terms in the past ten years, and have dropped by 30% in real terms, even though the cost of generating electricity has shot up. The cumulative difference between what it costs [utilities] to produce power and what they are allowed to charge for it—the “tariff deficit”—has now ballooned to €14 billion ($22 billion), according to the Spanish National Energy Commission (CNE). The Spanish electricity market is cut off from the rest of Europe, dominated by a duopoly and subject to artificial price controls. So one could hardly say that any incentives to promote renewable energy are distorting an otherwise free market. Wind farms installed before January 1, 2008, are entitled to a premium of 40 euros per megawatt-hour over electricity pool prices until the end of 2012, whereas those that went online afterwards may receive a maximum of 82/MWh. These subsidies (which translate to 5.5 to 11.4 cents per kWH) bear little relation to those encouraging renewable energy in the U.S. For instance, the Bluewater Wind project does not rely on such a direct subsidy for generation, but on a production tax credit of 2.1 cents per kWH. All of this may explain why Spain's electricity market behaves very differently than ours. But there's another fact that suggests that any generalization from Spain to the U.S. is simply unwarranted: Renewable energy in the U.S. does not cost 59 percent more than conventional energy. If Bluewater's price had come in that much higher, the project would not have been approved. Back in 2007, Harris McDowell tried to scare us away from adopting offshore wind by pointing to the high cost of electricity in the Netherlands. Dave Anderson's reference to an analysis of Spain's electricity market is no more relevant than McDowell's reference to the price of Dutch electricity. I said it then, and I will say it now: I am in favor of wind power, but not at any price. Wind and other renewable sources make sense because the prices are increasingly competitive, and the long term value proposition is compelling in an era of increasing demand for and limited supply of fossil fuels. "A special kind of courage"
This AP photograph taken on May 11 depicting Spc. Zachery Boyd of Fort Worth, Texas, wearing pink "I love NY" boxer shorts made the front page of the New York Times. The [Waxman-Markey] bill’s passage, on a 33-to-25 vote, served as a bookend to a week that began with President Obama’s announcing a deal with auto manufacturers to impose tough new mileage and emissions standards for all cars and trucks sold in the United States starting in 2012. MR. IMMELT: Mr. President, I think clean energy is the most exciting, fastest-growth industry of the 21st century. We've got about 70 energy-efficiency products, about $18 billion in revenue this year. We have 50,000 jobs between GE and our supply chain, lots of small- and medium-sized companies in this country and around the world. OWENS: I agree with Jeff. I think we have the technology, we have the smarts here, and the product technologies, the economic incentives of what’s needed. And that’s why I think of us in industry support a clarity around a carbon price, because that’s going to drive a lot of innovation and a lot of efficiency and will get with the program of reducing carbon emissions. If the CEO of Caterpillar is on board with cap-and-trade, then we are seeing a real shift in attitudes in American industry. Just as automakers like the certainty of the new efficiency standards, industrial companies like GE and Caterpillar are saying they would like to have the carbon issue settled so they can make capital investment decisions with greater certainty. Is Reducing CO2 Emissions Bad for the Environment? Many of us have noted for years that the green movement seems to be governed by those out either for power or money. They have paid off scientists, left wing ideologues, global power brokers, an educational establishment wanting a new social organizing force, and corporate manipulators joined to empower and enrich one another under the cover of environmentalism. Which leaves me wondering why I haven't cashed in yet, as mentioned by my friend liberalgeek in this entertaining post on April 1. The resources redirected to combat so called global climate change will actually comprise [perhaps he means compromise] other objectives. If we avoid converting trash to energy for fear of CO2 then we end up land filling it which may compromise our water supply. Actually, burning trash to generate electricity is a bad idea in several respects. First, waste-to-energy is not the only way to reduce landfill accumulation. Much flammable trash can also be recycled, which can reduce landfilling without toxic air emissions. Second, a waste-to-energy plant emits more than CO2. Municipal waste contains lots of nasty stuff that most people wouldn't want to see coming out of a smokestack. What about building a waste-to-energy facility? Cost estimates of a facility that would achieve 40% diversion are hard to come by, but the capital cost is likely to be $100 to 200 million—20 to 40 times that of a comparable recycling facility. With such a large capital outlay, a waste-to-energy facility would have to generate revenues on the order of $10 million to 20 million annually to break even. Here again, financial analysis tools can guide us. When facing a decision between a modest capital investment and a large capital investment, the magnitude of the risk must be considered. The enormous financial risk associated with a waste-to-energy facility should caution us against moving hastily in that direction. I know it's hard for free market fundamentalists to imagine that environmentally sound policies might be economically sound as well. It's a topic I've covered many times over, most recently two days ago. As hard as it might be for free-market fundamentalists to understand, automakers have openly welcomed a consistent, predictable standard they can use for planning and developing their products. After Japanese makers gained a foothold selling small, inexpensive cars to Americans, they leveraged their strength in that segment to introduce a wider range of products, until luxury brands like Lexus were seen as superior to their US counterparts. It's hard to see why automakers shouldn't be able to meet the new standards. Even though engines have been getting more efficient, average fuel efficiency actually dropped over a twenty year period, due mostly to the sale of ever bulkier vehicles. Dave Anderson at DelawarePolitics.net warns that the proposed new auto fuel standards "could be the beginning of the end of American Prosperity." Auto industry officials said it would provide the single national efficiency standard they have long desired, a reasonable timetable to meet it and the certainty they need to proceed with product development plans. As hard as it may seem for free market fundamentalists, auto execs seem to welcome a consistent, predictable standard they can use for planning and developing their products. New vehicles are expensive to design and build, and prolonged uncertainty about standards would increase costs and force auto companies to delay basic decisions about new products until well into the development cycle. We've reached that point, as I said earlier, that inflection point where jobs, economic growth, and the environment are the same shade of green, Gov. Talking about the green economy is easy. Capitalizing on the opportunities it represents is not, because few if any states have really figured it out yet. The state which most effectively marshals its resources in support of an intelligent strategy is likely to reap real dividends. I have been making the point that the view that "the public’s environmental interest is in conflict with the public’s economic interest" is outdated from the beginning of the debate on wind power. GE CEO Jeff Immelt, who spoke last night at the Carper Roundtable, remarked that changing views on energy and the environment make for "surprising bedfellows" among NGOs and business. Duke Energy Corp. has parted ways with the National Association of Manufacturers, in part over the organization’s opposition to a cap-and-trade approach to carbon legislation. Duke is a founding member of the U.S. Climate Action Partnership. That industry group has proposed carbon regulation and called for the kind of cap-and-trade system now being considered by the U.S. Congress — and opposed by NAM. If you go to USCAP's website, you will learn the organization is populated by environmental extremists like Alcoa, BP America, Caterpillar, Chrysler, ConocoPhillips, Deere & Company, Dow Chemical, DuPont, Exelon, Ford, General Electric, General Motors, Johnson & Johnson, NRG, PepsiCo and Xerox Corporation. Evidently, these industrial giants, including the automakers, believe that acting to prevent climate change will not be bad for business. "I believe that this may be the single greatest opportunity to reinvent American industry, putting us on a more sustainable path forward," said Charles Holliday, Jr. Chairman of DuPont. "A federal climate program has the potential to create real economic growth through innovation." In principle, emission taxes and tradable emission permits are equally effective at limiting pollution. In practice, cap and trade has some major advantages, especially for achieving effective international cooperation. Not to put too fine a point on it, think about how hard it would be to verify whether China was really implementing a promise to tax carbon emissions, as opposed to letting factory owners with the right connections off the hook. By contrast, it would be fairly easy to determine whether China was holding its total emissions below agreed-upon levels. For that matter, it's not hard to imagine U.S. industries slipping loopholes into unrelated tax legislation. But an open market can shed more light on actual carbon emissions than the fine print of the tax code. After all the years of denial, after all the years of inaction, we finally have a chance to do something major about climate change. Waxman-Markey is imperfect, it’s disappointing in some respects, but it’s action we can take now. And the planet won’t wait. Most parallels between Barack Obama and Franklin Roosevelt focus on their activism in the face of economic crisis. But there is another similarity: they have both seen their dogs used in political attacks. Greg Sargeant highlights a Republican National Committee web video parody of the MasterCard "priceless" commercials that opens with the words, "a new best friend: $2,000" over a picture of Barack Obama walking his new dog, Bo. Now the video seems tame enough, and unlikely to make much of a dent in Obama's poll numbers. But if Michael Steele's crack communications team at the RNC had read their history, they might have learned the perils of using a popular president's dog in a political attack. These Republican leaders have not been content with attacks on me, or my wife, or on my sons. No, not content with that, they now include my little dog, Fala. Well, of course, I don't resent attacks, and my family doesn't resent attacks, but Fala does resent them. You know, Fala is Scotch, and being a Scottie, as soon as he learned that the Republican fiction writers in Congress and out had concocted a story that I had left him behind on the Aleutian Islands and had sent a destroyer back to find him -- at a cost to the taxpayers of two or three, or eight or twenty million dollars -- his Scotch soul was furious. He has not been the same dog since. The speech helped cement FDR's election to a fourth term. Fala became known as the most famous dog in the world. The brick building on the left is Carnegie Hall. 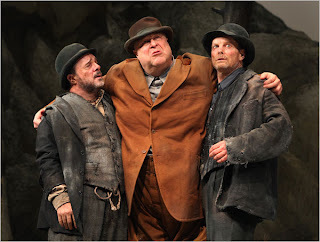 It has been more than fifty years since Waiting for Godot has been staged on Broadway. The new production stars Nathan Lane, John Goodman, Bill Irwin and John Glover (not shown). For those who like their existentialism delivered by Shakespearean actors, a production starring Ian McKellan and Patrick Stewart just opened in London (reviewed here in the Guardian). But the play offers more than a few opportunities for clowning. Nathan Lane makes sense as Estragon when you consider that the original production featured Bert Lahr, best remembered as the Cowardly Lion in The Wizard of Oz. But in 2009, Anthony Page’s smart, engaging production for the Roundabout Theater Company makes it clear that this greatest of 20th-century plays is also entertainment of a high order. Broadway doesn't have to be all about Disney characters. Musings about the meaningless of it all can be entertaining. Trivia questions: In what 80s hit video did Bill Irwin appear? What other comedian played in the video? Which role did that other guy play in Godot? And what other famous comic was part of that production? In what Woody Allen movie did John Glover appear? What was the name of his character? Bonus points if you can quote from his short but memorable appearance. For Delaware, as the only state with a valid PPA [power purchase agreement] and easy access to all shore points off the East Coast, we must seize our advantage. Let’s work to ensure that the Claymont Steel Mill produces the steel for the windmill towers and foundations, not just for Delaware, but other projects as well. This is a project the former Lt. Governor John Carney and his team have worked hard on and I commend them for it. And most important, it's a way to build a platform -- build a platform for the economy of the future. John, it's not just the platforms you're going to build for these windmills; it goes much more than that. Carney's firm, Transformative Technologies (TT) has two business groups that the firm believes could improve economic and environmental conditions at Claymont Steel. The first, called DelaWind, was set up to take on the wind tower project, hopefully not just for Bluewater, but for other east coast offshore wind projects as well. The second, called ReCoGen, uses combined cycle technology to increase the energy efficiency of industrial facilities. Claymont Steel is considered antiquated; its Russian owners have not invested in significant upgrades for the plant since buying it a couple of years ago. TT's managers are convinced that ReCoGen could create enough savings to make the plant more competitive and finance some badly-needed emissions controls. Metallic dust from the plant has plagued the community for years. The Claymont community has been monitoring air quality around the plant, using a grant from a previous owner and a national consultant to interpret the results. DNREC has a web page devoted to the long history of environmental problems at the steel plant. In commenting on my post on Chrysler, Steve Newton of Delaware Libertarian describes me as being "excited at the prospect of stakeholder capitalism at Chrysler." I am sure there will those who see this as an advance in economic justice or social democracy, but the implication that no legally-entered contract is now safe from the government restructuring it in favor of some creditors but not following law and precedence is an important deviation away from the rule of law toward the rule of politicians without constraint. This has set me to thinking about Obama’s activist approach to the economic crisis. What is the proper relationship between government and industry? Steve worries about the government’s use of "heavy-handed tactics to modify contracts retroactively in pragmatic pursuit of social, political, and ideological goals." While I agree that it’s heavy-handed to push for a workout of existing obligations, I would add that it's done in business all the time. (Perhaps you've heard of Henry Kravis and Donald Trump.) I would add that Chrysler’s bondholders weren’t the only parties to see their stake diminished; the company’s workers have taken a pretty big hit as well. The difference with Chrysler is that the government has become a big investor in the company—and that’s new, at least in the U.S.
To be clear, I don’t have a preference for stakeholder capitalism. My preference, refined and reinforced by my business school training, is for robust shareholder capitalism. Shareholder capitalism is all too often an ideal observed more in the breach than in the observance, for instance when managers seek to bamboozle their investors, as happened with Enron, WorldCom and Bank of America. We may be in for an era of greater shareholder assertiveness, as happened when BofA’s Ken Lewis was dropped as chairman at last week’s annual meeting. I also learned that corporate governance takes many forms, and that companies in Europe and Japan can compete with very different financial structures and board memberships. For instance, Volkswagen’s board includes government ministers and employee representatives, and the company seems to be doing just fine, having just posted a profit of 2.5 billion Euros. One concern with stakeholder capitalism in the U.S. is that it is tried when a company is in deep distress, which means we may not see a clean test of whether the model works in America. Most boards are not inclined to tinker with their corporate governance when things are going well. Capitalism is a powerful force for marshaling resources to create wealth, but we should recognize that it comes in different varieties. While I share a preference for shareholder capitalism, I have studied other models enough to conclude that they shouldn’t be dismissed outright. "It's time for us to dream really big." Vice President Joe Biden and Interior Secretary Ken Salazar didn't have that much news to report at their event to promote offshore wind power. The news was the event itself. By taking time to highlight the importance of renewable energy, particularly offshore wind, they become more invested in the success of the Bluewater Wind project. Biden and Salazar talked about quickly finalizing procedures for awarding permits for offshore wind projects, which had been sitting on someone's desk for several years. Salazar said he predicted that ten to twelve applications will be filed before the end of the year. "I expect Delaware is going to be at the point of the spear" in offshore wind power, he said. University of Delaware professor Willett Kempton emphasized the size of the opportunity, saying that the east coast of the U.S. has 16 times as much wind capacity as it does offshore oil. Gov, the prospects are unlimited. The prospects are unlimited. And it's time for us to dream really big, not small. This ultimately is about jobs. It's jobs, jobs, jobs, jobs, jobs, jobs, jobs. At that moment, he may have been addressing his remarks at either Jack Markell, or Russ Peterson, who was among the guests of honor. For the record, no one who spoke referred to Biden as "Veep." Peter Mandelstam of Bluewater Wind told me that the company has attracted interest from quite a few potential investors. He said that he has time to consider offers, since Bluewater has the working capital to carry itself well into next year. Knowing that the federal government has already set the procedures in place to approve offshore wind projects helps; investors don't like uncertainty. His presentation was low-key, authoritative, and had the look and feel of moderation. When you can give this impression while some of your decisions—for instance, on the legitimate cost and reach of government—are not, actually, moderate, you are demonstrating a singular political talent. He is subtle and likes to kill softly. As such, he is something new on the political scene, which means he will require something new from his opponents, including, first, patience. I am wondering once again if Republicans in Washington fully understand what they are up against. The other day Sen. Jim DeMint said he'd rather have 30 good and reliable conservative senators than 60 unreliable Republicans. Really? Good luck stopping an agenda you call socialist with 30 hardy votes. "Shrink to win": I've never heard of that as a political slogan. Former Massachusetts Gov. Mitt Romney compared the GOP to Americans fighting the British during the Revolutionary War. "We are the party of the revolutionaries, they [Democrats] are the party of the monarchists," he told the overwhelmingly Republican crowd, saying the Republicans needed to "once again lead the American Revolution." Do these guys know how to read polls? Most Americans aren't looking for a revolution; we want our new president to succeed. (Rush Limbaugh had the GOP tying itself in knots over that one earlier this year.) Barack Obama's favorability ratings still lead the pack by a wide margin. The right track-wrong track numbers have rebounded sharply since January, even though most voters don't expect the economy to rebound for two years. Barack Obama is the organizing principle of politics today; he drives conservatives crazy the way Ronald Reagan drove liberals crazy. The sooner Republicans get that, the sooner they can start making themselves relevant again. The new Chrysler will look vastly different from the old, and not just because it will be smaller. The United Auto Workers will own a 55% stake in the company in return for concessions worth billions of dollars. The US government will own 8% percent, and Canada will own another 2%. Fiat will be given three seats on the board, and will be able to earn up to a 15% stake in the company if it hits certain benchmarks, including producing a 40-mile-per-gallon vehicle in a US factory. This new corporate governance model, with government and unions involved, shifts Chrysler from shareholder capitalism to a different model called stakeholder capitalism. In shareholder capitalism, return on investment is paramount. Management considers other stakeholders such as workers and suppliers as tools to earn a profit. And for those who object to government and unions having a say in how the company is managed, it's worth pointing out that the feds stepped in when Chrysler had nowhere else to turn for capital.